Flip Out Mama: Exciting News From Domino's Pizza PLUS #GIVEAWAY! I don't know about you guys, but the holidays are such a busy time for us. I don't really have a lot of time to cook, especially considering the fact that I am only home two nights a week (thanks, work!) We spend a lot of time and money during the holidays eating out, and our favorite pick is probably pizza. That's why I am so excited to tell you guys about some exciting news from Domino's Pizza! First of all, this Thursday, December 8th, is Global Domino's Day! Global Domino's Day is in honor of the pizza chain's 51st birthday this week, and also a celebration of the fact that nearly half of Domino's 9500 stores are located OUTSIDE of the USA! WOW! Anyways, what does this mean for you?? On December 8th, if you order a pizza online through Facebook, Domino's will be offering 50% off menu priced pizzas!! What a deal is that!??! Make sure that you join Domino's on Facebook here so you can take advantage! 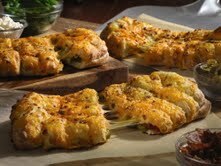 Another awesome thing I am proud to announce from Domino's is their new line of Stuffed Cheesy Bread!!! YUMMM!!! Cheesy Bread is my favorite food, so I am super excited about this one! There are three great flavors: Bacon & Jalepeno, Spinach & Feta, and Cheese Only. This cheesy bread has as much cheese as a medium pizza! Yummm! Don't forget to make a donation to St. Jude when ordering your pizza! You can also text "PIZZA" to 50333 to donate $5 to St. Jude. What a wonderful cause, and Domino's will be matching their customer's donations up to $250,000 this year! You have to be excited about such a wonderful campaign! Domino's is so nice, they are giving away a $20 gift card to one lucky Flip Out Mama reader! All you have to do to enter is answer the easy entry! 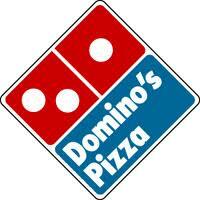 What is your favorite Domino's product!?? Winner will be chosen via random.org at approx 11:01 pm on 12/10/2011. Winner will have 48 hurs to respond to email notification or an alternate winner will be chosen. My favorite is the double pepperoni pizza and the bread sticks! yummy!